Format: Knowledge and application level MC and TF questions that assesses GIS literacy and application abilities. 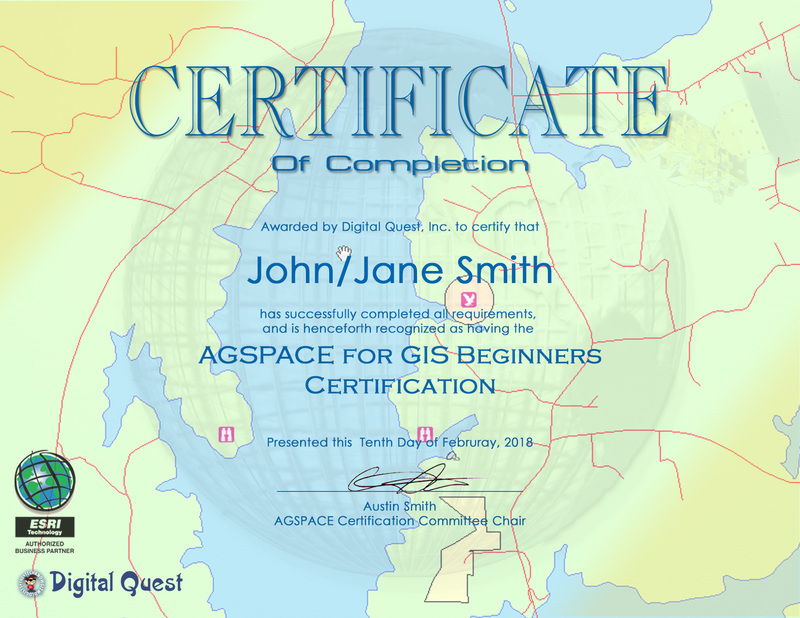 “AGSPACE for GIS Beginners”, a Florida Digital Tools Certificate, provides students the opportunity to demonstrate proficiency in GIS technology, a digital mapping tool. Digital Literacy on this topic is essential as maps have become an essential presentation tool in digital media, print media, and in-person presentations. The occupational outlook for all direct GIS careers is largely listed as “faster Than Average” or better, and many indirect careers require knowledge of GIS ad are also categorized as “faster than average”.nd environmental settings. GIS technology is a cross curricular technology in classes from STEM/engineering to agriculture to marketing to logistics. Most all technology from phones to farm equipment to drones use location and GIS is the core tech of gathering and presenting that data. This certificate will help in multiple career areas from hard science to business, and leads to multiple CAPE certifications and professional certifications. Combined with the free availability of ArcGIS software, GIS has never been more important as a digital tool and never more readily available to all students. Beyond AGSPACE students have opportunities to continue to expand and gain additional skills through High School CAPE geospatial programs: SPACE GIS User and STARS Geospatial Techniciancertifications. Turn learn more about SPACE and STARS and contuing education from high school to industry: Click Here! To add a layer to a map document, use the _______ tool. they are legally required for all printed maps. a map cannot be printed from ArcMap without these elements. otherwise the data contained in the map cannot be fully understood. they serve to map the map layout more attractive. Which of the following layer types would best illustrate forested areas on a map? Labeling each point on the map with the business name, contact person, and address. Creating a separate report with a list of business names and addresses. Advising map users to click on each point with the identify tool to gather all of the information. This information cannot be provided.